Here we'll be reviewing a couple of biscuits each week, from as many different makers as we can - including advice on how well it dunks. If you'd like to suggest one for us to review get in touch and we'll do our best to add them to our biscuit tin. 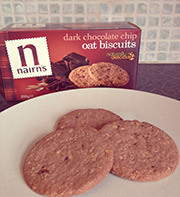 Nairns are the purveyors of a selection of oat cakes and whilst the oat cake is a healthy snack for toddlers across the land, the gooey mess that a half-eaten oat cake becomes is every parent�s nightmare. And those that do make it into a child�s tum in tact usually leave a Hansel and Gretel-like trail to prove their brief existence. So seeing that Nairns has produced a oat biscuit fills me with two thoughts - one, are they going to be messy and two, are they going to be bland. Preparing myself three biscuits, the first thing I notice is that they don�t look as tempting as they do on the box. Funny that. There seems to be a chocolate chip or twenty missing and they don�t cry out �eat me�. But not one to be perturbed I break a biscuit into half and am pleasantly surprised with the relatively carpet-friendly amount of crumbs. And yet these mid morning treats look pretty darn dry. The first second or two of eating doesn�t do much to allay those fears. Even drier and crunchier than oat cakes the texture just isn�t that great. And yet as you chew the chocolate does peep out from behind the oatiness, but I�d say the description of containing �chocolate chips� is a slight exaggeration. The oaty flavour actually adds to the depth of taste though, making it much more palatable than I�d have imagined. When we see big biscuit makers launch a new range we always want to have a try, so we were intrigued to sample the latest addition to the McVitie's family. Unfortunately, the packaging isn't very inspiring and if I hadn't seen the word 'new' emblazoned on it, I would've easily overlooked these biscuits. The pictures on the packet don't look overly inspiring and on cracking them open these sweet treats look so very, very dull. I knew they were full of chocolatey hazelnuttiness, but the biscuits housing the filling were pale and uninteresting, and unfortunately just tasted the same. Bland and dull, even the filling couldn't rescue these biscuits. These biscuits are huge and when you open the packet the chocolately smell hits you straight away. They look a bit pale and insipid at first glance, but they're stacked with chocolate chunks and are very, very thick - so we're not complaining! They are delightfully crunchy and crumbly and also have a lovely coconutty taste, which really adds to the flavour. We've described a lot of biscuits as 'moreish' - mainly because we like eating lots of biscuits - but these truly are. After a minute or two of finishing one, the thought enters your head "oh, I could just eat another..."
From the same range as the Fox's Chunkie Milk Chocolate Cookies, these biscuits are very similar, but half covered in chocolate. Possibly the best biscuit in the world?! These are a must try. Go buy some. Now! Branded as an 'indulgent treat', these biscuits look very pretty - and just the sort of thing you'd bob on a plate on a Sunday afternoon when your nan was coming to visit. These are crunchy chocolate biscuits topped with thick dark and white chocolate in a pretty pattern. The chocolate topping is thick, just as described, and sits larger than the biscuit itself, so you feel like your having a really indulgent treat. The simple packaging belies the really nice biscuit hidden within - give these bad boys a go, you won't be disappointed. These golden oldies have been around for donkeys years, but they must be good to have stood the test of time. Rather uninspiring packaging, we can imagine these biscuits are favourites at WI meetings up and down the land - if of course the ladies simply didn't have time to whip up a batch of their own biscuits. Vanilla cream is sandwiched between two small biscuits and the word 'crunch' in the description is no understatement. We're very excited about this week's biscuit choice - so much so we're just featuring one product. Lovely 3bt fan Donna brought back some official, proper, bona fide Girl Scout Cookies from her recent trip to New York. Not just something we've seen on tv and in films, there really is an official Girl Scout Cookie that America's little ladies pound the streets selling door to door. Apparently the Girl Scout Cookie Program promotes financial skills such as goal setting, decision making, customer service and money management. Proceeds from the cookies support local girl scouts in the US of A. Now we often have debates about whether cookies should feature as part of Three Biscuit Thursday, but these bad boys look pretty nice, and Donna did bring them about 3500 miles for us, so it would be rude not to try them! We've got the thin mints, and they're very nice. A bit like last week's Viscount biscuits, they are minty and chocolatey - and you get lots in a box. Although the biscuit itself is a bit dry, they are actually very moreish, which is probably what those pesky girl scouts are hoping for - so you'll buy more and they can raise more money! Thanks once again to Donna for bringing them back - and next time tell us when you're off to the big apple and we'll come too to choose some different flavours! We've featured another product from this range so thought it was time to try another. There seem to be a lot of 'posh' ginger biccies on the market at the moment - so making one that stands out from the crowd is tricky. These biscuits are really thick - and we like a good solid biscuit! It takes a couple of bites for the ginger taste to really come through, but once it does it's really warming. The dark chocolate rounds the whole biscuit off nicely. Buy some, we don't think you'll be disappointed! Again, we've recently featured another product from this range - and they were particularly yummy - so we thought we'd try these. These biscuits don't look as aesthetically pleasing as their chocolatey counterparts, and we'd have to say the same for the taste. They're a pleasant, light biscuit and the raspberry filling is a nice sweet twist, but they do taste like posh mix between a jammy dodger and a custard cream. A bit of a let down after recently trying the Chocolate & Cream version. In the Three Biscuit Thursday team we�ve obviously never lived as none of us have tried them before. The biscuits are really dark, with the strip of white cream filling in the middle providing the contrast. They are actually quite dry biscuits, and we can see why they�d go well with a glass of milk. But they�re tasty and moreish � could easily get through six for 3bt. Never a market leader, the Viscount biscuit has been around for years, and at least one of the Three Biscuit Thursday team fondly remembers eating them as a child! These are one of the rare biscuits where you unwrap each individual treat. The green foil wrappers are almost identical to all those years ago, and as soon as you unwrap one, the minty smell hits your nose. Just opening the pack, these biscuits smell super tasty. These biscuits are a welcome addition to the Fox's range - and for a company that was established in 1853 it can't be easy to come up with new ideas. The biscuits look like posh bourbons, and in essence that's what they are, just better. The packaging tells us there are 12 biscuits lurking inside - perfect for 3bt. Mixing shortbread and ginger biscuits into some hybrid super biscuit was always going to be tricky and we're not sure the co-op has quite perfected it. The biscuits look quite plain but we gave them a try anyway - the taste is the key. They have a lovely ginger flavour and the chewy stem ginger pieces are a welcome addition. However the shortbread in general isn't quite what we expected. It's actually a really nice biscuit, sweet and rich, but when you buy shortbread you have expectations of what the biscuit will be like. Definitely worth a try though. These mini biscuits come in wrapping featuring the recognisable Cadbury purple as well as a host of cartoon animals. The mini biscuits are really quite tasty - and they're half covered in chocolate and shaped as animals to boot. Some of the biscuits do take some identifying and we seemed to have a glut of elephants, but hey, they all taste the same, so it doesn't really matter! The only complaint would be that there's not enough chocolate, but since these biscuits are aimed at kids, that's probably no bad thing. From the makers of the ultimate cream crackers comes Iced Gems, firm favourite of children - and adults willing to admit they went through a bag or two back in their day. Not really seen as a biscuit for grown ups, the packets feature friendly polar bears and little quizzes and games on the back - which invariably get torn when you open the packet. A huge proportion of Iced Gem eaters, no matter what their age, must find it hard to resist parting the icing from the biscuit. Most toddlers probably don't even eat the biscuit, but we suggest you eat both. Although the packet says the topping is fruit flavoured we weren't convinced we could taste any hint of fruitiness, we just found them a bit sugary. The biscuits are quite plain, but for those who can resist biting the icing off, the biscuit and topping go together nicely. But how many Iced Gems constitute a portion for 3bt we hear you ask. Three really doesn't cut it, we'd suggest 15 as a minimum. A very thin biscuit, as the title suggests, but they still pack a crunch and are drenched in chocolate. These biscuits come dipped in milk, dark and white chocolate � so three different varieties to mix things up a bit, and you can have one of each to keep on track with 3bt. The different chocolatey coatings all make for a very different experience with each biscuit � the consensus is that the milk chocolate version is the leader of the pack! The chocolate chunks in these cookies add a real kick, but if we�re honest the actual cookie is just a bit dry � and certainly too soft to dunk for fear of losing the whole thing at the bottom of your mug. A bit disappointing after the high quality of other biscuits in this range. This biscuits remind us of our childhood, they're a good old fashioned family biscuit. They are also probably the finest example of a dunking biscuit you are ever likely to try - we recommend just a couple of seconds though if you don't want to lose half of it in your cuppa. A good biscuit on it's own, awesome when you dunk it! A double chocolate biscuit with a creamy chocolate - what's not to like? And unlike most other chocolate biscuits they're good dunkers because the chocolate is on the inside, not the outside. So if you love chocolate, and you're and avid dunker these might be the biscuits for you. Ok, so they aren't the most opulent biscuit but for approximately 2p each they are well worth a try! We think these are best described as catnip for kids. A really nice simple iced biscuit, having said that they are extremely addictive - so if you buy some for the kids, make sure you save them one or two. They also boast a mere 29 calories each and no artificial stuff. These are definitely for grown-ups. A thick layer of milk chocolate covering a shortcake biscuit topped with honeycomb flavour crunch cream. We think these are a perfectly well rounded biscuit, not too expensive but tasty enough that we had real trouble just eating three. For anyone who's ever been stung by a bee, your suffering was worthwhile. Gu has launched a new range of American-style cookies, and whilst there may be some debate over whether these count for 3bt, we decided to give them a try. The pure fact they�re made by Gu means that we�re probably going to be in for a treat. If their puds were anything to go by, we knew these cookies would be rich, chocolatey and taste very naughty! As you open the packet, you can actually smell the cherry over the chocolate, and it smells divine. The taste is rich and deep, and leaves a long lasting impression. Not sure I could eat three of these in one go � but I�d give it a good try! Another American style cookie, which is always going to look a little pale and uninteresting next to the dark, sumptuous Gu cookie. However, looks can be deceiving. These cookies are soft and chewy, and very very sweet. The white chocolate sits beautifully alongside the cookie taste, and at 80p for five, these cookies are a great alternative to their Gu counterparts. The packaging for these biscuits doesn't give much away, but for less than 2p per biscuit we're not expecting miracles. The name of the biscuits gives us an idea of the quality. They are cookies with chocolate chips, not chocolate chip cookies - and there certainly weren't many chocolate chips. However they are quite palatable, although they probably aren't going to satisfy a chocolate lover. They're a great way for eight people to enjoy 3bt for just 40p! Any biscuit that promotes itself as being quadruply chocolatey is a winner for us. These biscuits look the part, smell delicious and taste even better. They're packed with chocolate chips and half covered in chocolate. Nice. Very nice. And very morish. What can you expect for less than 40p. Surprisingly, quite a lot actually. A nice crunch, a full gingery taste, and a great dunker � this biscuit is surprisingly satisfying. The actual biscuit size is quite small so it might be advised to aim for six throughout the day. The box says these biscuits are exquisite, it tells us why they are great, they�re organic and the company even donate money to children�s charities when you buy them.